IPOB leader and other top IPOB high command are expected to meet with European Union ( EU) officials to gather more international support for the Biafra proposal. Recently Mazi Nnamdi Kanu had been holding "useful talks" with a number of diplomats on a successful referendum bids for Biafra on 16 February 2019, and we can assure you that the majority of them have given their assurances and the proposal has received tremendous support from many key allies who see self-determination for Biafra as the best solution to the present Nigeria problem. Thanks to OKIKE, I must participate in the referendum. The happiest day of my life. May God bless IPOB leadership! Biafra nation must be liberated from this animal kingdom called Nigeria. 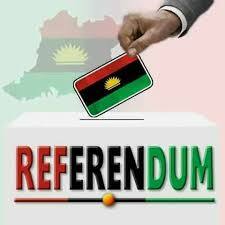 Still doubting Biafrans, change your mind and vote for BIAFRA on that very day. Don't disappoint our Leadership! We have nothing to do with those murderous contraption calls Nigeria. God bless our homecountry BIAFRA!